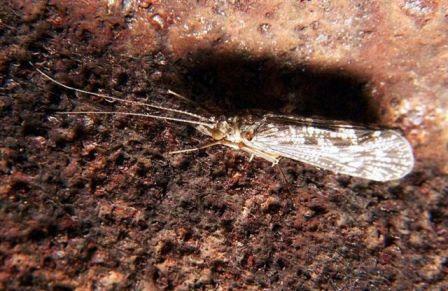 Identification: Adults have long legs and four brownish wings covered with hairs. Antennae are nearly as long as the body. Larvae are aquatic and often in cases. Biology and life cycle: Larvae live under water, some in cases, some just clinging to stones. Eggs are laid in ropes or masses in or near water, often under stones. Complete metamorphosis. Habitat: Sunny areas near water. Adults fly by day. Feeding habits: Most adults do not take in food. Larvae feed on small aquatic animals and bits of vegetation. Economic importance: Important source of food for trout and other fish. Insight: Some caddisfly larvae make a delicate silk net that they use to catch various microscopic organisms in the water.